It's barely six months since we reviewed the DS211+, which is one of the fastest and most feature-laden NAS enclosures we've ever reviewed. 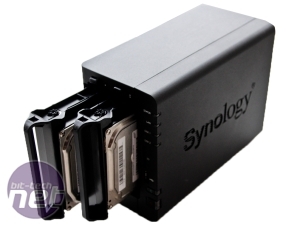 Yet Synology has already released its successor, the DS212+, which yet again features a beefed-up specification and numerous other gubbins. 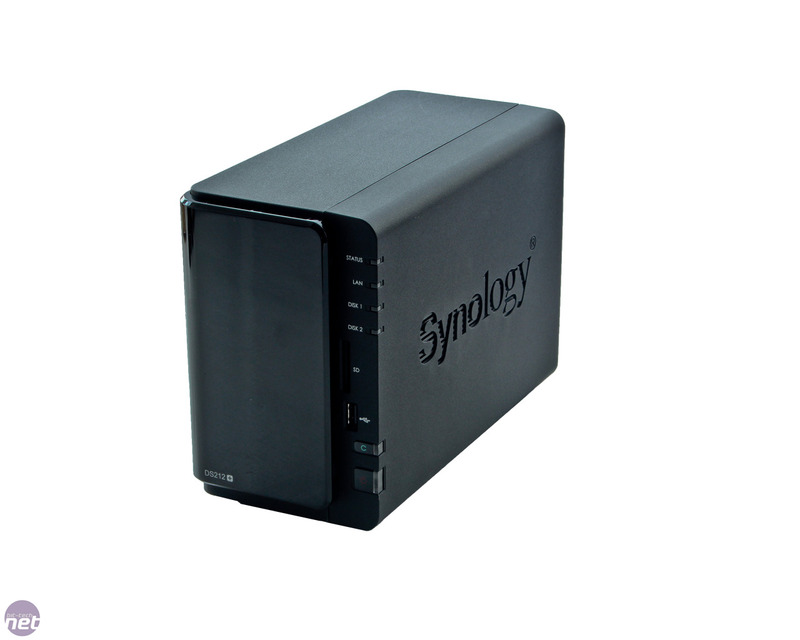 While owners of the former will likely be a bit miffed, we have to commend Synology on its relentless upgrade schedule, which allows it to keep up with and very often stay one step ahead of the competition. These upgrades are rarely pointless either and are in fact useful. 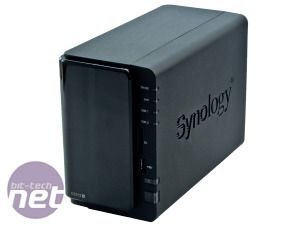 Whether or not bit-tech is the reason for some of these upgrades we're not entirely sure, but one of our requests to Synology over a very early pre-Christmas dinner several months ago was that USB 3 should be included in the DS212 range of products. Sure enough, when the DS212+ landed in our lab recently, we were pleased to see two shiny new blue USB 3 ports at the rear of the unit. That's not all that's new with the DS212+ though. The DS212+ has received a speed boost in the CPU department, taking the 1.6GHz Marvell Kirkwood CPU of the DS211+ and adding another 400MHz on top to give a nice round 2GHz. The DS211+ was no slouch when it came to dishing out data, but the additional speed should further justify the hefty price premium these powerful high-end NAS enclosures demand. You can see if this made a difference in our performance testing. 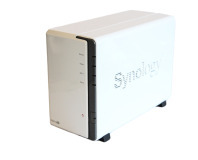 According to Synology, the DS212+ also sports slightly reduced load and hibernation power consumption, the former down from 24W with the DS211+ to 18.7W with the newer model - in percentage terms, a sizable drop, which further adds to the argument that a NAS is the way to go if you're concerned about power consumption. The rest of the specification is pretty much identical, though. There's the same 92mm fan, which made a huge difference with the DS211+ compared to previous models in terms of cooling and noise. 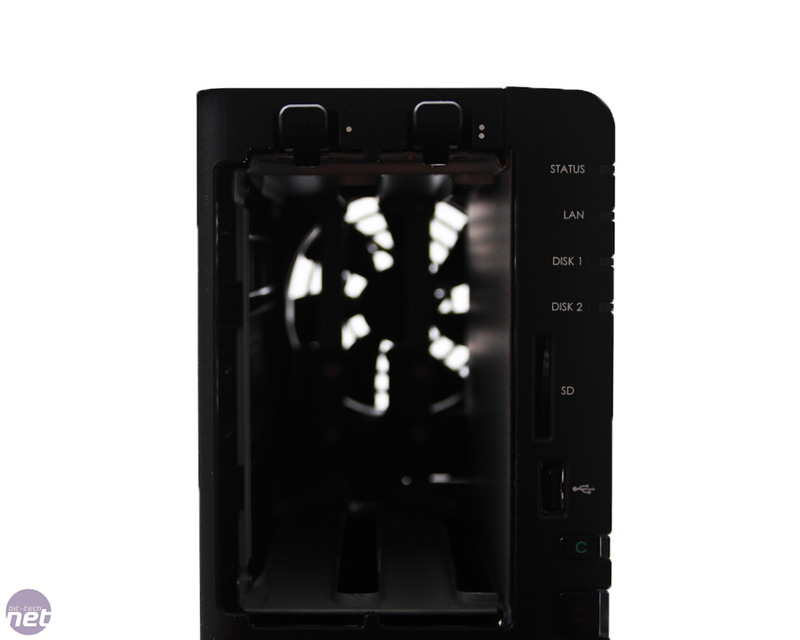 The black plastic exterior is the same, as is the push-fit, anti-vibration drive bay cover, while the hot-swappable drive cages feature the same anti-vibration mounts, similar to those you'd find in a 3.5in drive bay in a decent PC case. 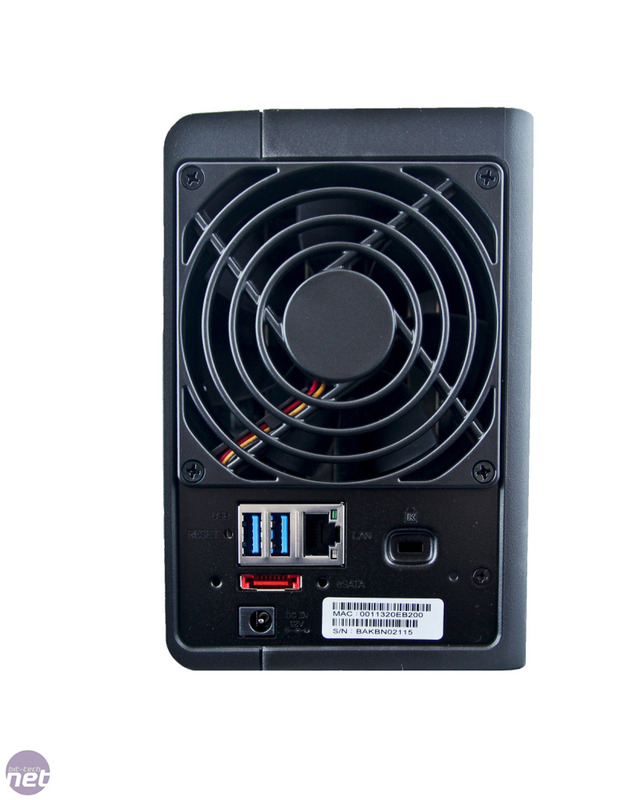 The latter, in operation, do seem to cut down on noise and vibration - the DS212+, like the DS211+ is the best NAS enclosure we've come across in this regard, however, all NAS enclosures we've come across do exhibit a certain amount of 'rattle' when the hard disk is being accessed and the DS212+ is no exception. 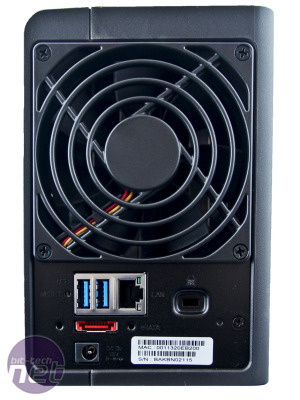 In addition to two USB 3 ports at the rear of the unit, there's an eSATA port here too and a further USB 2 port on the front panel along with an SD card slot - great if your digital camera uses them but thankfully the USB ports also support memory card readers in conjunction with the very handy copy button on the front panel, which allows you to dump your latest photo session straight onto the NAS without needing to use your PC. As well as regularly updated units hitting the shelves, Synology also releases new versions of its DSM operating system regularly, which can and do add new features, improvements and speed boosts. One of the great things about it is that a vast majority of features are available on all its NAS boxes, with more expensive models simply offering beefier specifications or more drive bays. The DSM 3.2-1958 version we used sports Synology's familiar OS-style multitasking interface, which, while it isn't as flashy and simple-looking as that found on QNAP's models, is very intuitive, lag-free and un-cluttered, with help, either via a search box or links to help sections of its website, never far away if you get stuck. 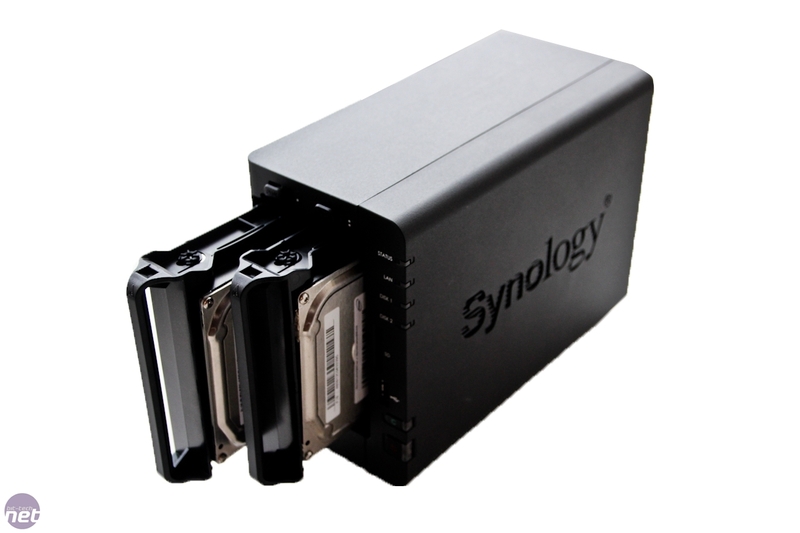 If you've read previous reviews of Synology's products, you'll know just how well-featured they are. Whether you need to store and share photos, music, videos or data, there's a plethora of tools at your disposal. There's DLNA/UPnP support for easy streaming to consoles and compatible TVs, although this wasn't enabled by default, instead requiring a couple of clicks in the UI to configure things such as the menu style, then activating the DLNA/UPnP media server itself. This worked well on our WDTV live for example, and you're also able to tweak settings such as thumbnail quality if things are getting a bit laggy on the other end and create or re-index folders that are indexed. 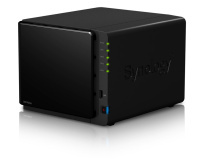 If you're in need of Squeezebox support, this isn't supported out of the box as far as we could see, but you can download a 'package' via Synology's website that should get you up and running. For general music, video and photo sharing, folders are created automatically and can be found under 'Diskstation' in your network, meaning that creating a basic media library shouldn't take very long at all, and there's plenty of customisation along the way. If you need to create shared folders, they'll appear here too, and you have the option of setting access rules for groups and users for each shared folder you create. 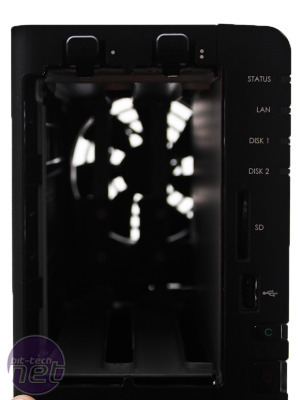 With a maximum of two hard disks available, the DS212+ supports RAID 0, RAID 1, and JBOD with the option to select either in the storage manager when you're creating your volumes for the first time. This is also the place to setup iSCSI, which can be useful for certain programs such as Windows Media Center which can have problems using shared folders/mapped network drives rather than local drives. NAS files encrypted, ransom demanded. Real-time transcoding, four drive bays. 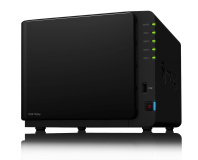 Synology has added built-in WiFi and a beefier spec to it's latest mid-range NAS box.